This past weekend, I had a chance to rediscover my love for cooking and baking. Life has been busy enough lately with many things and I have really missed just enjoying the kitchen. It was wonderful. I paged through my new magazines, planned a menu to serve my brother and his girlfriend for Sunday dinner, and then made three new recipes. They were successful, dinner was lovely, and I loved having some creative time in the kitchen! Our garden is getting closer to having ripe produce and I can't wait. The green tomatoes are just starting to turn red and yellow and the zuchinni is almost ready to harvest. I've been using a lot of basil from my plants and using some thyme as well. We are looking forward to the Indianapolis Devour Downtown which is August 2-15! You can check out all the amazing restaurants that are participating - they have some delicious looking menus! 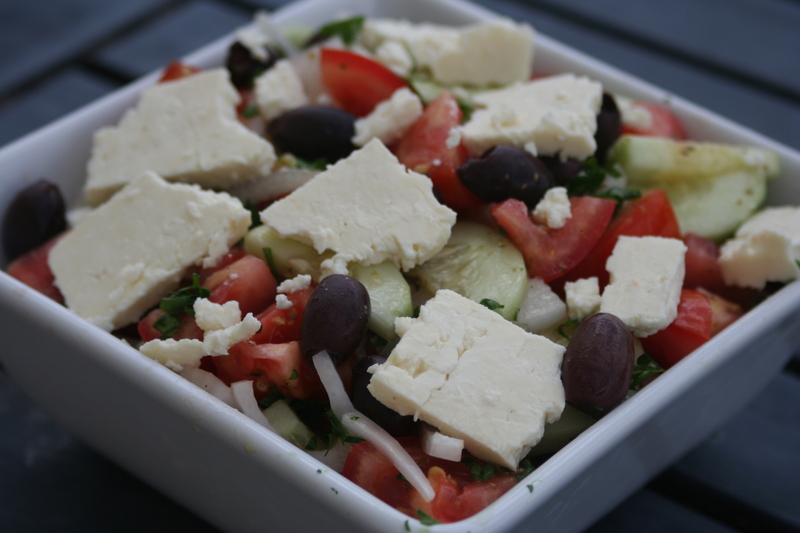 I'm going to give you a little preview of the August issue of Saveur and share this yummy Greek Salad. It was flavorful, fresh, colorful, and really tasty. I used less feta then the recipe suggested but put a little extra on the table to pass for those who wanted more. We really enjoyed this salad!